July 2018 & September 2018 Meeting Notes were not recorded - view PowerPoint presentations below. March 2018: Tom Brockenbrough, CRS Coordinator for Accomack County, presented on their last CRS Cycle Visit, after which the County increased their rating from a class 8 to a class 6, saving policyholders a total of 20% on their flood insurance premiums. This presentation contributes to our Workgroup's "Successes & Lessons Learned" effort. Kim Tempesco, Emergency Planner for the City of Virginia Beach presented on the City's revised FEMA Hazard Mitigation Grant elevation pilot program. Download the PowerPoint presentation from the meeting HERE. January 2018: The group discussed the draft FEMA policy on accessory and agricultural structures. Charlie Baker (charles.baker@fema.dhs.gov) from FEMA participated in the meeting via Zoom video conference and answered questions Workgroup members had related to the draft policy. Mary-Carson Stiff reviewed multiple proposed bills in the Virginia General Assembly: SB 1588, HB 2506, and HB 2175. Ashley Gordon (agordon@hrpdcva.gov), Coastal Analyst for the Hampton Roads Planning District Commission (HRPDC) introduced a new regional flood insurance promotion campaign run through the regional PDC. Ashley specifically walked through two draft Outreach Projects and one draft website that are a part of the campaign. Mary-Carson then provided an overview of CRS Activity 330 - Outreach Projects and Activity 350 - Flood Protection Website. Then she ran an exercise for the Workgroup attendees on how to review, mark up, score, and document the two sample outreach projects and the regional website. The final documentation versions of the two outreach projects and the website will be made available to the region once drafts are finalized. You can download the PowerPoint presentation from the meeting HERE. 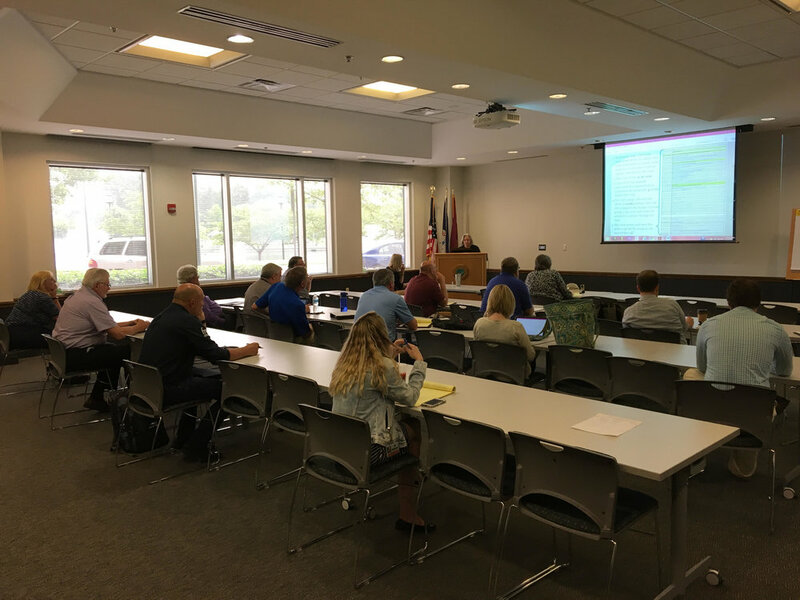 November 2018: Zane Hadzick, FEMA Region III, Mitigation Planning Specialist, provided some FEMA updates and was available to answer Workgroup attendee questions. James City County staff Darryl Cook, CRS Coordinator and Christy Parrish, Zoning Administrator, presented their CRS Standard Operating Procedure (LINK), a process that will help safeguard CRS knowledge in the County for the future. Darryl and Christy also presented on their floodplain program review (LINK) - an informational training for County employees. You can download the PowerPoint presentation from the meeting HERE. September 2018: Whitney McNamara, from the City of Virginia Beach, presented the PowerPoint she gave at the 2018 ASFPM national conference in Phoenix, AZ. Whitney’s presentation, “Sea Level Rise, Flooding, and Credit Rating,” is included in the workgroup PowerPoint presentation available for download HERE. July 2018: This workgroup meeting covered a number of topics. Mary-Carson provided an update on the NFIP reauthorization and reforms from Rich Sobota, FEMA Region III. Workgroup members also discussed the May workgroup presentation given from VDEM on FEMA hazard mitigation grants and the more in depth presentations given by FEMA and VDEM at the Hampton Roads Planning District Commission (draft PowerPoints included in the workgroup PowerPoint). Mary-Carson also presented on a current Coastal Zone Management Program grant that includes CRS research. We highlighted a potential Activity 420 (Open Space Preservation) Report Out format from Accomack County, which can serve as a template for future presentations from CRS communities in the Workgroup. Finally, Mary-Carson presented highlights from the 2018 ASFPM national conference, held in Phoenix, AZ in June. You can download the PowerPoint presentation from the meeting HERE. May 2018: Bring your Grants Manager to Workgroup Day! Robbie Coates, Hazard Mitigation Grants Manager at the VA Department of Emergency Management (VDEM), presented on the various activities eligible for FEMA hazard mitigation grant funding. The presentation and discussion looks specifically at how coastal VA communities could apply for projects under an innovative new program, Climate Resilient Mitigation Activities (the Program's name changed under the new administration), and lead the way in our state & FEMA region for larger scale protections that promote resilience, while also reducing flooding. You can download the PowerPoint presentation from the meeting HERE. March 2018: Bring your GIS Manager to Workgroup Day! We welcomed Melissa Rosa & Rebecca Love from NOAA Digital Coast who presented (electronically due to weather related travel cancellations) a training on how communities can use GIS to map parcels for credit under Open Space Preservation (Activity 420) in the NFIP's CRS Program. The full NOAA training was recorded and available for viewing below (the training begins at minute 19). You can download the PowerPoint presentation from the meeting HERE. January/February 2018: Make-up meeting held on February 14. Mary-Carson presented background information on CRS Activity 420, Open Space Preservation, in advance of next month's 420 GIS Training. See the Workgroup Powerpoint presentation for more info. November 2017: Guest speaker Tyler Ardron, Licensed Insurance Broker & Certified Floodplain Manager for Smartvent & Risk Reduction Plus Group, presented to the Workgroup on various topics, including, outreach eligible for CRS credit, elevation certificates pitfalls, National & VA NFIP statistics, NFIP reform / reauthorization, private v. NFIP policies, and mitigation success stories. See the Workgroup meeting PowerPoint presentation for this information. Our meeting included a lot of discussion, but of specific note, the City of Virginia Beach has been negotiating with FEMA Region III on an issue that impacts how they administer FEMA mitigation grant assistance in the City. In November, the City received this letter from FEMA Region III that clarifies homeowners may contract directly with contractors on mitigation projects. Previously the City was required to enter into a mitigation contact as a third party. Download the Workgroup's PowerPoint presentation here. September 2017: Mary-Carson presented an update on a recent grant funded by the VA Coastal Zone Management Program to study the costs and benefits of the CRS Program in Virginia. This grant specifically looks at whether the CRS is being used as a tool for building resilience in the Coastal Zone, in addition to surveying the specific amount of time Coordinators spend on the CRS each year and the co-benefits of enrolling in the CRS. The final grant deliverable, a white paper, will be released by Wetlands Watch in October. Kristin Owen, from VA Department of Conservation and Recreation, presented an update on the VA DCR Floodplain Management program. Discussion about the NFIP Reauthorization was lead by the Hampton Roads Planning District Commission, who requested locality staff submit feedback about specific recommendations they would like to include in a formal letter to the Congressional delegation. Check out Wetlands Watch's NFIP Reauthorization Legislative Tracking Doc here. Download the PowerPoint presentation here. July 2017: Zane Hadzick, FEMA Region III, Mitigation Planning Specialist, attended the Workgroup meeting. Zane introduced himself and offered to answer any questions from Workgroup members. Mary-Carson Stiff, CRS Workgroup Chair & Wetlands Watch Director of Policy, presented on the most interesting and relevant presentations from the Association of State Floodplain Managers Annual Conference in Kansas City, MO this past spring. The presentation also included an overview of conversations with CRS Coordinators outside the tidewater VA region and a description of a cost-benefit analysis project Wetlands Watch is completing for the VA Coastal Zone Management Program. Download Mary-Carson's presentation here. Continuing Education Credit (CEC) for Certified Floodplain Managers (CFM) is pending. May 2017: Meg Pittenger, CRS Coordinator for the City of Portsmouth, presented on their last CRS Cycle Visit, after which the City increased their rating from a class 9 to a class 7, saving policyholders a total of 15% on their flood insurance premiums. This presentation contributes to our Workgroup's "Successes & Lessons Learned" effort. Download Meg's presentation here. This meeting was approved for one (1) Continuing Education Credit (CEC) for Certified Floodplain Managers (CFM). March 2017: Rich Sobota, FEMA Region III, presented to the Workgroup. Rich's presentation was made available to Workgroup members via email, but will not be posted online due to the changing status of the NFIP: new Administration and Program reauthorization scheduled for September 30th. This meeting was approved for six (6) Continuing Education Credits (CEC) for Certified Floodplain Managers (CFM). January 2017: Kent Henkel, CRS Coordinator for York County, presented on their last CRS Cycle Visit, after which the County increased their rating from a class 8 to a class 7. This presentation contributes to our Workgroup's "Successes & Lessons Learned" effort. Download Kent's presentation here. Download the documentation submitted for Open Space Preservation (Activity 420) and Additional Map Data (440) on the Successes & Lessons Learned page. In addition to a presentation from York County, Mary-Carson presented information about the updates in the 2017 CRS Coordinator's Manual Manual. The Manual is not yet available for download, but will be posted on CRSresources.org and distributed by Mary-Carson via email. The following documents will help CRS Coordinator's navigate the update: Overview of 2017 CRS Manual Revisions, Changes to Manual PowerPoint, List of Manual Changes, Updated Master List of Elements. November 2016: Darlene Messina (darlene.messina@fema.dhs.gov), FEMA Region III, presented on recovery and repair post Hurricane Matthew. John Ritchey (John.ritchey@fema.dhs.gov), FEMA Insurance Technical Specialist, presented on loss avoidance. Richard Sobota (Richard.Sobota@fema.dhs.gov), FEMA Region III & CRS Contact, was also present & presented. Materials provided to the Workgroup include: Sample Disaster Recovery & Reconstruction Ordinance Language, Loss Avoidance Measures Section of FEMA Guidance, Flood Resistant Design Guide, and Flood Resistant Materials List. September 2016: No presentation - discussion of available resources for inventorying open space. July 2016: Floodplain Management Planning (Activity 510), Presentation by Meg Pittenger from the City of Portsmouth on the City's recent floodplain management plan. ISO score = 254 points! Click HERE FOR A PDF of the presentation and read Portsmouth's Floodplain Management Plan here. September 2015: Updated Coastal Flood Insurance Study (FIS) for Hampton Roads, Brian Batten from Dewberry. Powerpoint Presentation: click HERE FOR PDF VERSION and HERE FOR POWERPOINT. March 2015: CRS Credit for Upcoming Hampton Roads Hazard Mitigation Plan, Leigh Chapman from Salter's Creek Consulting. Locality Capability Table: click HERE TO DOWNLOAD TABLE. January 2015: Summary of Wetlands Watch's Virginia Specific CRS Report, Shannon Hulst Jarbeau & Mary-Carson Stiff from Wetlands Watch. Powerpoint Presentation: click HERE FOR PDF VERSION and HERE FOR POWERPOINT.